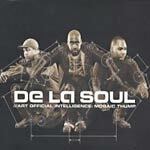 Arriving with a bang in the 21st Century, four years after Stakes is High, De La Soul announced that this fifth full-length album would actually be the first in a series of three to be released within a year. But even with 12 years of history and a solid fanbase around the world that reaches even to people outside of the hip hop genre, the group was up against some harsh criticism due to certain cameos, several party cuts, and some unfamiliar production. And although the Grammy nominated album even turned out the hit single ''Oooh'' featuring Redman, it was still unable to reach numbers that previous albums had achieved, a factor that struggling label Tommy Boy later had to take into account for the future and completion of the next two planned releases of AOI. But heres the real kicker...Art Official Intelligence: Mosiac Thump, is an album that fans and critics were a little too critical of, reminiscent of the same criticism A Tribe Called Quest was met with back in 1998 over The Love Movement, its an album that when you go back to it, especially now, theres is a greater appreciation for it. A year later AOI: Bionix was released quietly and faded soon after, the third part of the series was never released.